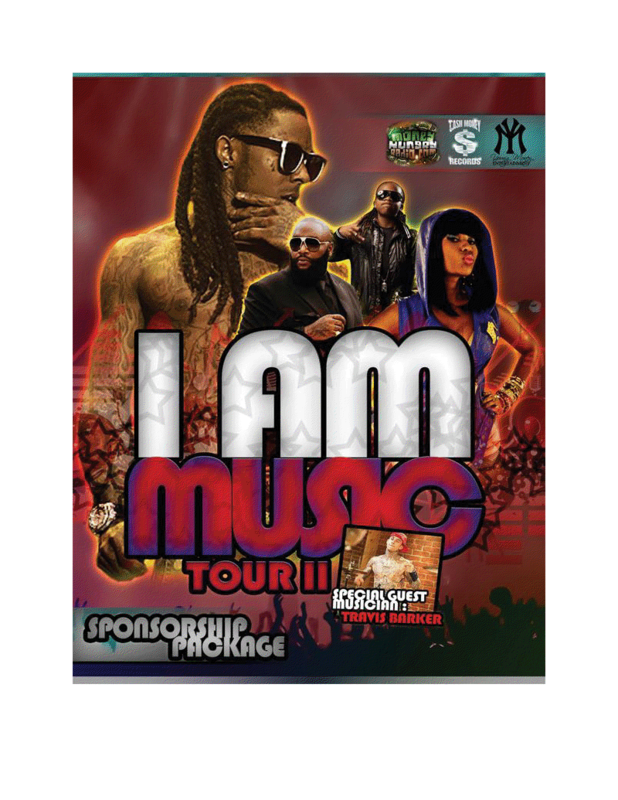 The I Am Still Music Tour II is a sequel to The I Am Music Tour, Which was a concert tour, headlined by American rapper Lil Wayne and grossed approximately $42 million drawing nearly 804,000 fans in attendance. With the announcement of the I Am Still Music Tour II and the additional artists that will join Lil’ Wayne such as Young Money protégé’s Nicki Minaj and Lil’ Chuckee, Miami rapper Rick Ross and Blink 182 drummer Travis Barker the attendance has been massively increasing. ● Your Sponsorship with the I am Music Tour II Tour Bus is more than just an investment in advertising; it is an investment in Local communities and the people within it. Your Sponsorships also allow us to bring a strong positive message of “Stop the Violence” to the local schools and community centers nationwide to kids and communities that rarely get such a positive message from a worldwide figure. ● You may be asking why your business should sponsor the tour bus. The answer is simple: to help drive new customers to your business. This bus will be traveling across the nation as well as stationed at each tour date. ● Music fans, artists and their families represent the coveted demographic groups of young people still forming purchasing habits. ● The current economic environment is a perfect time to evaluate all your advertising and marketing opportunities and focus on those providing the best return for your dollars. The combination of exceptional demographics and low cost of sponsorship make this an extraordinary opportunity to improve your image and expand your customer base. Book any of the Young Money Artist (Cory Gunz, Lil Chuckee, Jae Millz, Lil Twist, Gudda Gudda, Shanell), Lil Wayne, Nicki Minaj, or Rick Ross for your official after party at any of the remaining dates listed above.